I am a great fan of beautifully designed homes with matching elegant furnishings and fixtures. Why not? Who would not want to live in style? Well, it's not about luxury but I really love going to spa for steam bath and body massage and how I wish to have one elegant and functional jacuzzi at home which I could indulge with during my spare time. I'm a health conscious individual and would normally look after beauty and wellness. I also have a strong faith in the healing power of hydrotherapy. Aside from the fact that it can offer comfort and massage, it is also an alternative way for a relaxed bonding activity with your family. Soaking in a jacuzzi before sleep can relieve you of all the stress acquired during the day and could also bring you to a good night sleep. I think that soaking in a warm bath complete with massage pressures from your jacuzzi could also help ease the pains of aching muscles, so this will be good for older people, too. 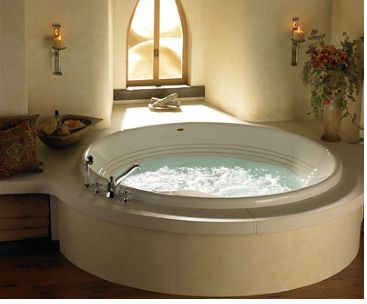 For those who are planning to build their homes and want a jacuzzi in place you could consult and visit qualitybath.com for jacuzzi tubs . You will surely find a design that could complement the size and the color of your bathroom and price range would be up to it's design, size and features. I was thinking that if I could have one in the house, then I could lessen my trips to spa. It could help, not only me but all the members of the family as well. Jacuzzi could also aid in lowering blood pressure and can help us prevent hypertension which is a killer disease now a days. Given the option, would you choose to get one for your house, too?